To mark the launch of the exhibition Archizines in Los Angeles, a discussion moderated by Sylvia Lavin, UCLA architecture and urban design professor and director of critical studies and M.A./Ph.D programs, will bring together architecture, art and design publishers to explore the different approaches to subversive visual culture and how this relates to architectural criticism. UCLA A.UD is delighted to host the critically acclaimed international exhibition ARCHIZINES in the Perloff Gallery, the 18th stop on the world tour that has taken in cities from Tokyo and Osaka to New York, London, Paris, and Berlin. ARCHIZINES celebrates the resurgence of alternative and independent architectural publishing around the world. The touring exhibition, curated by Elias Redstone and initiated in collaboration with the Architectural Association, now features 90 architecture magazines, fanzines and journals from over twenty countries that provide an alternative to the established architectural press. Edited by architects, artists and students, these publications provide new platforms for commentary, criticism and research into the spaces we inhabit and the practice of architecture. The publications, all launched after 2005, vary in their style and approach to editing architecture. However, together they make an important and often radical addition to architectural discourse and demonstrate a residual love for print matter in the digital age. 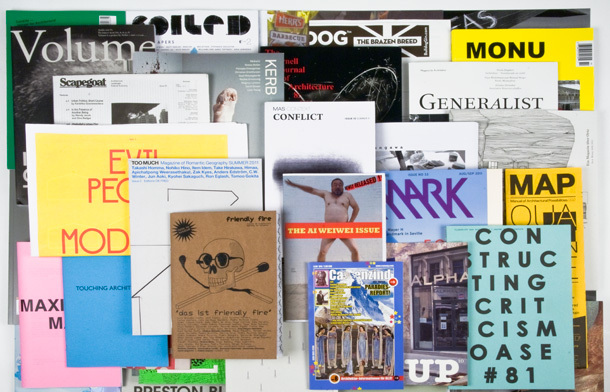 Each publication has selected one issue to be presented in the exhibition. These are all available to read alongside video interviews with their creators, revealing the people behind the publications and the shifting relationship between architecture and publishing today. The ARCHIZINES collection continues to grow as more publications are discovered, and the full collection is being transferred to the National Art Library at the Victoria & Albert Museum, London.